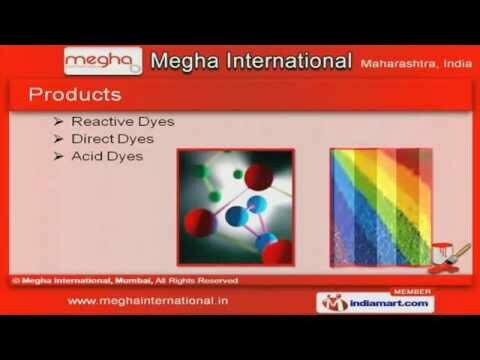 Welcome to Megha InternationalManufacturer & Exporter of Dyes & ColorantsThe company was incepted in 1995 at Mumbai. We are a registered member of D& B & D-U-N-S & caterto Textiles, Paper & Leather industries across Indian Subcontinent, Europe & other countries. We are well known in the market for our stringent quality control measures, competitive prices, timelydelivery schedule & extensive product line. Our product list includes Reactive, Direct & Acid Dyes. We offer premium grade Basic & Solvent Dyes. Along with that we provide Mordant & Vat Dyes (Indigosol). Our Salt Free & Metal Complex Dyes are a class apart. Rapid Dyes & Food Colors are some of our best selling products. We are specialized in offering Pigments Dyes for Ink.